Welcome to Our Photographic Bookmarks section. We can provide a variety of lithographic press products- From Calendars to Note Cards to Posters- All custom designed for you. All Bookmarks are very high quality, printed in the US on heavy glossy cardstock, and feature a durable 3 mil plastic lamination for UV and moisture protection. Bookmarks are 7 inches long. Fine Art Prints -- And Beautiful Canvas Prints from 12x36 to over 8 ft long. LARGER QUANTITIES --- LOWER PRICES!!! This section contains general information on our high quality press products, shipping information, special order information, and print information on the photographic art print program. All press products will feature the photography of Scott A. Kilgore. Most of these images will also be available as signed and numbered photographic prints from 6 x 18 inches to as large as 30 x 90 inches. Our bookmarks are printed on high gloss cover stock, and laminated with a durable 3 mil plastic lamination on both sides for a high quality long lasting bookmark. We want customers to purchase our bookmarks, again and again, because they last so long, and look so good. Bookmarks feature a high quality color photograph by the artist on the front, and usually feature information on the back in black with a grayscale graphic on the back unique and complementary to the image on the front. All designs are by Scott A. Kilgore. Since many of the birds and other animals we feature are , or have been endangered, conservation information about the subject will usually be presented. Bookmark standard sizes are 2 x 7 inches and 2.25 x 7 inches. The Special Order Bookmark Page contains styles that have been mastered but have not been press printed yet. 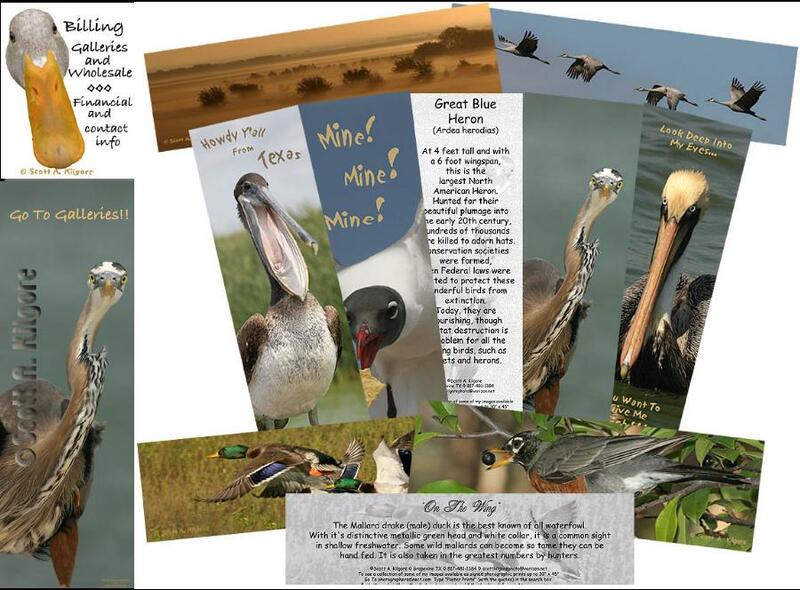 While we are not offering in stock calendars, postcards, note cards, posters, and other press products, we can design and provide them on a custom order basis. If you need a company brochure, business cards or other graphics, we can design and print them for you. Free shipping is included on all bookmark orders over $20.00 within the contiguous 48 United States. There may be a shipping surcharge on orders shipped to Alaska, Hawaii, and Canada. Currently, we do not ship outside of the United States and Canada. Shipping is via USPS or Fed Ex Ground service. Please allow 1 -2 weeks for processing and shipment of in stock products. Naturally, we travel a lot to get these images, so shipment can be delayed at certain times of the year. Non-stock items usually require proof and test runs. You should allow up to 4-6 weeks for normal delivery. Additional design services may add more time to your order.